Charles Edward Stuart, known as the Young Pretender and Bonnie Prince Charles was born and educated in Rome where he became the centre of Jacobite hopes to restore a catholic king on the throne of England. He arrived in England in July 1745 and soon raised an army of followers. He won a victory over Sir John Cope at the battle of Prestonpans on 21st September 1745 and in November of the same year left for London at the head of 6500 men to claim back the throne he believed was rightfully his. His catholic father should have been James 111 but had been ousted by his protestant cousins William and Mary in 1688. 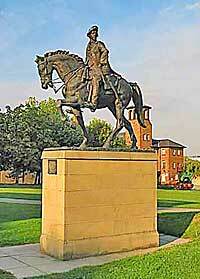 Charles Edward Stuart arrived in Derby on the 4th of December. The previous evening the Duke of Devonshire had held a council of war with the officers of the newly formed Derbyshire Blues, a regiment formed to defend the town of Derby, in the George tavern in Irongate, Derby, where it was decided to retreat 50 miles to Retford, leaving Derby to its fate. Whilst about 70 troops went forward and held Swarkeston Bridge, the only crossing point over the River Trent between Burton and Nottingham, Stuart's generals held a council of war in drawing room of the old Exeter House that use to stand in Full Street. It was decided that because of a general lack of support for them in England , they should turn back. Exeter House was demolished in 1854 and Derby Police Station was built on the same site. Charles Edward Stuart's army suffered a crushing defeat by the Duke of Cumberland's troops at Culloden Moor on 16th April 1746. He was hunted in the highlands for over 5 months with a high price on his head, but managed to escape abroad, where he lived out the rest of his life paying only a few secret visits to England. In 1772 he married Louisa, Countess of Albany, in Florence and he also had a daughter by a mistress. He died in Rome in 1788.